Taipei, Taiwan – March, 21, 2016 – Tt eSPORTS is excited to announce the brand new SmartBar technology that adds a touch input area onto the space bar of the new keyboard, the POSEIDON Z TOUCH. Engineered with a special spacebar that can be touched, swiped and programmed, thanks to capacitive touch sensors in the keyboard, it's perfect for both mechanical keyboard users and games enthusiasts. Specially engineering by adding a touch input area onto the space bar, which then lets you perform certain tasks without having to touch the mouse. Many more features have also been added to the software to make the SmartBar technology more useful. The SmartBar is highly flexible in terms of customization and gesture recognition and has more capability when it comes to macros as well! 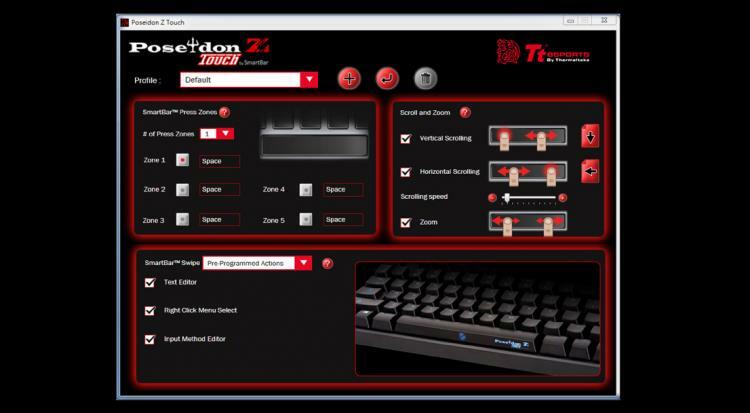 POSEIDON Z TOUCH's space bar has up to five zones that can be configured to perform horizontal/vertical scrolling, zoom in/out, certain swipes to bring up right click menus or text editor, or macro key simulation. With a SmartBar, gamers could forego having macro keys and use the SmartBar instead. This enables a more compact gaming keyboard without any loss of functionality as macro keys usually add quite a bit of size to a keyboard! If we’re proper typists, our thumbs should always be resting on the space bar, allowing quick access to a plethora of multi-touch gestures! Customize the keyboard and make it your own! Switch the Windows Key to CTRL key to lengthen the CTRL key with just one click! With the Switcher, you can mark this unique keyboard clearly yours! Also, its fully backlit keyboard with stunning metal plate that enhances the gorgeous backlighting! Offering levels of adjustable brightness with an additional pause-break lighting effect combinations that make it cooler! The leading mechanical blue switch actuates a bit after the tactile feedback of the key, but the Tt eSPORTS Certified Mechanical switches actuates earlier and closer to the tactile feedback. These switches were specially chosen by our pro-gamers and engineers, and we believe in them so much that we’re offering the world’s first 5 year warranty on a Mechanical gaming keyboard. Additionally, with the USB N-Key Rollover function, the POSEIDON Z TOUCH will allow you to hit combinations of keys at once to make sure your gaming session is as fluid as it can be without obstacles!